When wireless operator and upper-class girl Verity meets civilian pilot Maddie, you wouldn’t think they’d be friends. But during war, anything is possible and the two are as close as sisters. What would they do for each other? They’re about to find out as their mission fails and Verity is captured by the Gestapo in France and Maddie marooned amongst the French Resistance. It’s a somewhat sad fact that many young adult female protagonists can often be put into two boxes: those hopelessly and pitilessly in love and those who are headstrong, sarcastic and witty. Code Name Verity is one of a minority of novels that has two wonderfully unique and surprisingly authentic characters- Verity, a wireless operator with a gift for foreign languages and Maddie, female civilian pilot tasked with ‘ferrying’ RAF personnel and planes around Britain during the early stages of the Second World War. Without giving too much away – and this is important because much of Code Name Verity is based on character revelations – both are achingly authentic (or, at least, what I would consider to be authentic, having not experienced WWII myself) headstrong, intelligent and skilled females with a passion for serving in the war effort. Wein couldn’t have created to more likable and believable characters, but when they come together the novel really zings and the chemistry between them becomes tangible in the air as you read. From the very beginning, when Verity tells us that she is a “collaborator” and that she is writing everything she knows after being captured by the Gestapo in the (fictional) French town of Ormaie, to the end when Maddie’s narrative finishes the novel- everything we see and hear is through their recollections, and, most importantly, through their characters. By the end of Code Name Verity, the titular character is not the person she was at the start of the novel, not only having changed her identity in a very sly way on Wein’s behalf but also -and crucially- her persona changes indefinitely when Maddie’s narrative takes over. In fact, the Verity of her own tales is very different to the Verity Maddie tells of- and for excellent reasons which are fascinating to uncover. As Elizabeth Wein herself says in the Afterword, the novel is plausible. A great part of the enjoyment of Code Name Verity is derived from the fact that it could have happened- there’s no nonsense about it, and that, I think, is part of what makes a good historical novel. Wein makes the interesting choice of telling the story not in alternating chapters but as two blocks of narrative- first Verity and later, Maddie. This allows us not only to focus on one situation at a time- a luxury not always granted with contemporary novels but also adds a vital dimension to the novel (which I’m not at liberty to reveal- it’s a spoiler!) Verity’s narrative also takes a little getting used to as she switches from first to third person as she simultaneously switches from writing about her current situation to reminiscing to her life before her capture. 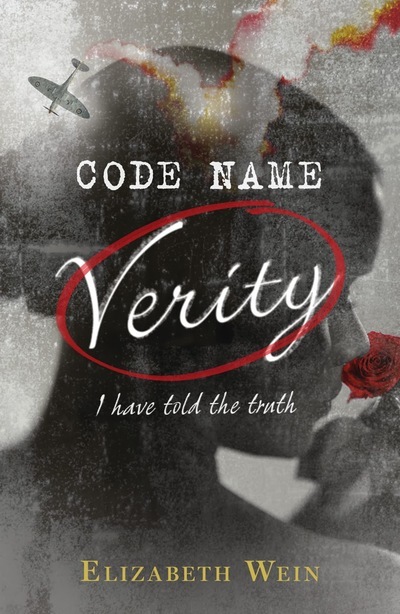 From the very first page, it is clear that Code Name Verity is a book to love and share. It’s not often that a novel such as this is published, but when they are, they are worth treasuring. Verity and Maddie are two characters worth holding on to, with their strong, sometimes humorous personalities, characters that are immediately relateable and lovable. Wein is also careful to present WWII as an area of grey rather than a black and white event, turning our sympathies even onto the Gestapo Hauptsturmfuhrer. Code Name Verity is a wonderful tale of friendship, loyalty and life – I think you’ll love it just as I did. What did you think about Code Name Verity? Everybody that I’ve seen who had read this one, seems to sing its praises. Seems a pretty special book. Great review, Rhys; you’ve highlighted so much that is wonderful about the two main characters. This is possibly my favourite book of the year so far. I have read rave reviews about code name verity would love to read it. Definitely sounds interesting – and I’m glad you enjoyed it so much! It’s nice to see YA authors trying to break the mode on characterization because, you’re right, YA characters (the main ones and even the supporting ones) tend to be rather patterned. Great giveaway,I’m always on the look out for good reads! Read loads of excellent reviews, will definitely have to check it out. I’ve enjoyed Elizabeth Wein’s other books. This one sounds like a winner as well. I’d love to win a copy. Thanks for the giveaway. I have heard so many good reports about this book: I’d love a chance to read it. I have read such good reports about this book: I’d love a chance to read it.